In seconds, a family vacation became a nightmare when a horrific vehicle accident almost took marathon runner Janet Oberholtzer's life. It decimated her legs and shattered her pelvis. Doctors weren't sure she'd ever walk again, but her determination, along with her traditional Mennonite upbringing (almost Amish), helped her through the difficult physical recovery the first few months. This was soon followed by a depressing, emotional and spiritual trauma, which surprised Janet and proved almost fatal as she struggled to come to grips with her new normal-pain, limitations and a deformed leg. 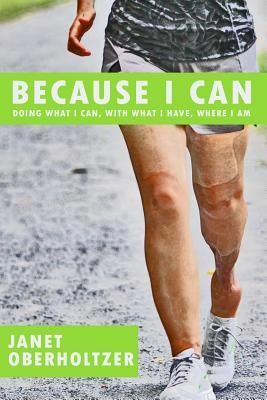 This included the struggle of keeping her marriage together, fighting through anger and depression and liberating herself from physical limitations to run again. Why? Because she can. Because I Can is not a Pollyanna story -- Janet still has disappointments and still asks questions. In spite of that, she's made a choice to live life to the fullest ... Doing what she can, with what she has, where she is.